Our PDF conversion is so accurate, it’salmost like creating a replica of your PDF in Word. Graphics, layout, formatting-everything is retained as in the original. The quality of document conversions is very high. The document conversion software supports more than 5000 fonts, apart from True Type fonts and symbolic fonts. You have the option of specifying multiple Word formats like ..DOC, .RTF or Microsoft Word XML for your converted output. Direct PDF Converter can convert PDF files generated through any application including Word, CorelDraw, Adobe Illustrator etc. Direct PDf Converter allows you to extract and save images used within the PDF. You can save the images in various formats including GIF, PNG, JPG and they can be re-used however you like. Direct PDF converter lets you select multiple files for conversion at a time so the whole conversion process is smoother and faster. A lot of PDF conversion software convert your PDF but the resultant Word document content is very often generated as a mass of text boxes that are extremely difficult to edit. 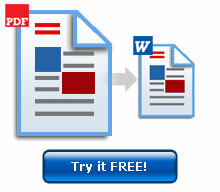 Direct PDF converter generates Word documents that are easily editable-just like ordinary Word documents. Direct PDF Converter gives you the ability to convert PDF documents to Word or .rtf in 9 languages: English, German, French, Swedish, Dutch, Italian, Norwegian, Spanish, and Portuguese. The GUI language can also be selected from a range of 10 languages including Chinese, Japanese, Korean, English, French, German, Italian, Dutch, Spanish, Swedish, Russian, Norwegian, and Portuguese. 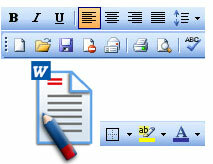 When you convert PDF to Word using our PDF conversion software, the active Hyperlinks are retained in the Word docs. which saves on time especially if you have a lot of documents to convert. We also provide software updates completely FREE to our registered users. You do not need Acrobat or any other software to run in conjunction with Direct PDF. It is a standalone application.